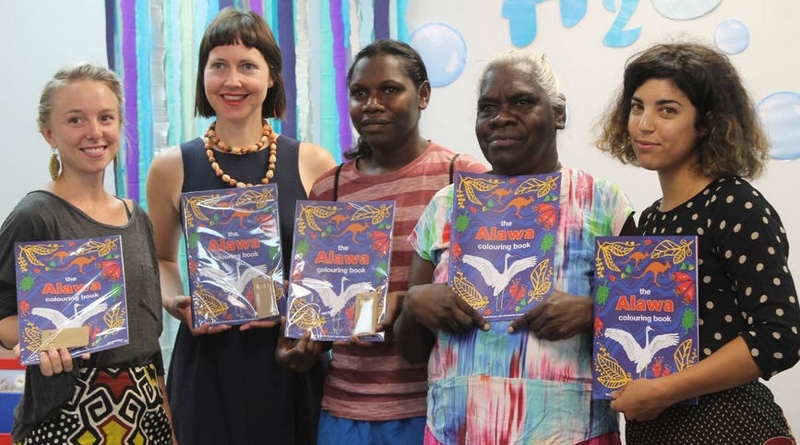 Katherine based Enterprise Learning Projects (ELP) has worked with the community of Minyerri to produce a beautiful colouring book to help children learn and preserve the Alawa language. Project leader Sarah Burrows said the idea was born last year when Minyerri community members were drawing and colouring in with the kids. “The children love to talk about bush food and birds and animals and some of the older community members commented that the kids were using Alawa words to describe them,” Ms Burrows said. Over the next few months, artists from the community worked with the project team to create drawings for the book, some of them based on existing art works in the Minyerri Arts and Cultural Centre. The result is a valuable teaching resource designed to create cultural awareness and strengthen use of the region’s traditional Alawa language. Research has shown that reviving traditional language in Aboriginal communities has led to a stronger sense of identity and improved mental health. Language preservation is a priority for many in the Minyerri community, said traditional owner and elder Naomi Wilfred. “Language gives us strength,” she said. Lil Tait, ELP Project Facilitator said the loss of Aboriginal languages in Australia has been devastating. This limited edition run of 500 prints was printed in Australia on 100% recycled paper, with proceeds going back to the community to fund further language projects. The book is available at the Finch Cafe, Katherine Visitor Information Centre and via the Enterprise Learning Project website, with a digital copy also accessible for download at the Katherine Public Library. Katherine’s Laura Egan founded ELP five and a half years ago, with a vision to promote and support grassroots micro business development in remote Aboriginal communities. “I saw a gap in support for people in remote communities who have great ideas,” she said. With a background in arts, commerce and business management, ELP has now assisted a number of projects to get off the ground across northern Australia. At Minyerri, ELP is also working on the development of a business to produce and market the local Gulbarn tea, which is used as a traditional medicine to cure coughs, colds and respiratory congestion. The tea is hand harvested, dried and packaged in the Minyerri community, which is located within the Hodgson Downs cattle station 270kms south-east of Katherine. The Alawa Colouring Book project was assisted by a Community Grant of $1500 from Roper Gulf Regional Council. The council’s Community Grants Program provides financial assistance of up to $3000 for projects that will benefit community events and activities, economic development, or the physical or natural environment. Round two is open from October 17 until November 25 and applications can be made by calling 08 8972 9038 or emailing grants.ropergulf@ropergulf.nt.gov.au.